For those of you who missed it, our day one review of the GTX 1660 featured a dozen games, many of which were recently released titles and there the new GPU came out looking like a champ. Today we're expanding the benchmark test to a grand total of 33 games to see how it stacks up to the likes of AMD's Radeon RX 580 and 590. While we don’t expect this expanded benchmark test to change much, it should serve as a decent buying guide for those tossing up between the GTX 1660 and perhaps the Radeon RX 580. The fact that the new GeForce GPU is some 30% faster in Assassin’s Creed Odyssey might not matter much if you predominantly play titles such as Strange Brigade, Battlefield V or Sniper Elite 4, to cite a few examples. To give you a better idea of how these two GPUs and more compare in a wide range of games, we put together this 33 game benchmark. The focus will be on 1080p, which is the most popular resolution for this kind of GPU, but we've also tested at 1440p making the entire analysis every bit as comprehensive as you may want. Our usual GPU test system was used, equipped with a Core i9-9900K clocked at 5 GHz with 32GB of DDR4-3200 memory. Drivers used include the AMD Adrenalin 2019 Edition 19.2.3 for the Radeon GPUs and Game Ready 419.35 WHQL for the GeForce cards. The first test in today's lineup is The Division 2. It's the first time we're featuring this brand new title in one of our benchmark features. Rather than using the canned benchmark we’ve recorded performance in-game. We can observe that the GTX 1660 is good for 68 fps on average at 1080p using the ultra quality preset. That figure drops down to just 46 fps at 1440p and while playable you’ll probably want to do some tweaking here to improve frame rates. As it stands the GTX 1660 was 15% faster than the GTX 1060, but 8% slower than the RX 590. Assassin’s Creed: Odyssey is a bad title for AMD cards and here we see the GTX 1660 basically matching Vega 64. But don’t expect to see that too often. The $220 GTX 1660 was just 12% faster than the GTX 1060 6GB, but 28% speedier than the Radeon RX 590. At 1440p we see a slight shift in the results. The 1660 maintained a reasonable lead over the 1060 and RX 590/580 GPUs, but was seen slipping behind the Vega GPUs by a slim margin. Next up we have Strange Brigade which is kind of the opposite of what we just saw. The GTX 1660 is only able to match the GTX 1060 6GB at 1080p, making it quite a bit slower than the Radeon competition. Much the same is seen at 1440p, with the GeForce 1660 running behind the Radeon RX 570, so obviously not a great result for Nvidia in this title. The GTX 1660 is back on top for our Star Wars Battlefront II testing, sitting between the RX 590 and GTX 1070, with 85 fps on average it’s in a category of its own. Then at 1440p we find a similar situation, where the 1660 was 17% faster than the RX 590 and 22% faster than the 6GB GTX 1060. It was also 15% slower than the GTX 1070. Moving on to Monster Hunter: World, the GTX 1660 is able to match the RX 590. We see much the same story at 1440p, and this means the GTX 1660 was 20% slower than the Ti version. Warframe has the GTX 1660 offering a small performance gain over the GTX 1060 6GB as well as the RX 590. Every GPU tested in this title was good for over 100 fps on average, so it looks like the win is shared among all GPUs for this one. Things become a little more challenging at 1440p, but even so the GTX 1660 was good for a 1% low of 90 fps with an average frame rate of 109 fps. This made it 9% faster than the old Pascal-based GTX 1060. F1 fans will enjoy what the GTX 1660 has to offer. At 1080p it was 11% faster than the similarly priced RX 590 and 18% faster than the older 6GB 1060. It was also just 16% slower than the GeForce GTX 1070 and Radeon RX Vega 56. At 1440p it manages to close the gap to the GTX 1070, while Vega 56 gets a little further away. But overall performance was strong with 61 fps on average. The last game we’re discussing the results for is The Witcher 3. Here the GTX 1660 is matching the RX 590 but surprisingly runs 3% slower than the old GTX 1060 6GB. Performance wasn’t any better at 1440p, where the 1660 only matched the 1060, placing it roughly on par with the Radeon RX 590. Here is the breakdown of all 33 games tested, comparing the GTX 1660 and Radeon RX 590 at 1080p. The GeForce GPU was on average 5% faster, down from an 8% win in our original 12 game test. So while the performance margin has shrunk a little, the new Turing GPU still came out on top and did so winning by a 5% margin or greater in 16 of the 33 games tested. Meanwhile the RX 590 was faster by a 5% margin or greater in just 5 of the games. Even though AMD has cut pricing to match the GTX 1660, they’ll need to do better than that for us to recommend the RX 590 over the GTX 1660. We see a dramatic difference when comparing to the previous generation GTX 1060. The margin dropped from 21% in our initial 12 game sample (day one review) to just 14% with all 33 games. That’s a big difference and as suspected the 1660 generally does much better in newer titles. Older games such as The Witcher 3, World of Tanks, Project Cars 2, and so on don’t hand the Turing architecture much of an advantage over Pascal. Finally when comparing head to head with the GTX 1660 Ti, the vanilla 1660 is 15% slower and that’s very much in line with the previous test which saw the non-Ti model come in 13% slower. Of course, we also saw times where the margin grew to 20% or more, and we saw that in half a dozen titles. Perhaps one of the key findings from this review compared to what we saw a week ago is not simply the number of games tested, but because Nvidia clearly undercut the competition, a week has been enough time for AMD to react and adjust prices, so our cost per frame comparison has seen some changes as well. On the upside, changes are not dramatic, and GTX 1660 cards are indeed selling at the intended $220 MSRP already. The RX 580 has dropped down from $200 to $190 which is not a huge deal, but still makes the Radeon a viable alternative for some. Essentially you can save ~10% on the cost of the graphics card to have 10% of the performance shaved off. The RX 590 has seen a heftier price cut with numerous models now available at $220. This GPU is finally down to the price it should have launched at. Given it’s a little slower than the 1660 but costs about the same, it’s not quite as good in terms of value. The only clear cut winner for AMD right now is the RX 570, but that’s roughly 25% slower than the GTX 1660 so they aren’t exactly in the same performance category. Meanwhile the RX 580 has gone from being the best value sub $250 option, to a somewhat tough sell. Of course, it’s best to look at performance in the games you’ll be playing. If you're primary playing DiRT 4 or Battlefield V, then the RX 590 is a better choice. Otherwise, as we just saw there are far more games where the GTX 1660 gets the better of the Radeon GPU. For those of you planning on buying and keeping your graphics card for 2-3 years and have no idea how things will look even just 6-12 months down the track, power consumption is worth keeping in mind. Not because we’re worried about the power bill, but because a more efficient graphics card is a quieter graphics card, and it’s also more friendly to other components in your case as it’s not dumping as much heat on them. The GTX 1660 pushed our test system's consumption to 262 watts. That’s a 12% saving compared to the RX 570 and almost 30% less than the RX 580 and 590. If we were looking at power consumption for the graphics cards alone those margins would increase significantly, making it clear Turing GPUs are much better in this regard. So in spite of a few pricing adjustments, our recommendation has not been altered from the original review. The biggest change has come from the sheer volume of games tested. The GTX 1660’s lead over the RX 590 shrunk, while the 590’s price also shrunk a little. So those two are more evenly matched now. It was pretty shocking to see the GTX 1660’s lead over the GTX 1060 6GB shrivel up from 21% to just 14%. 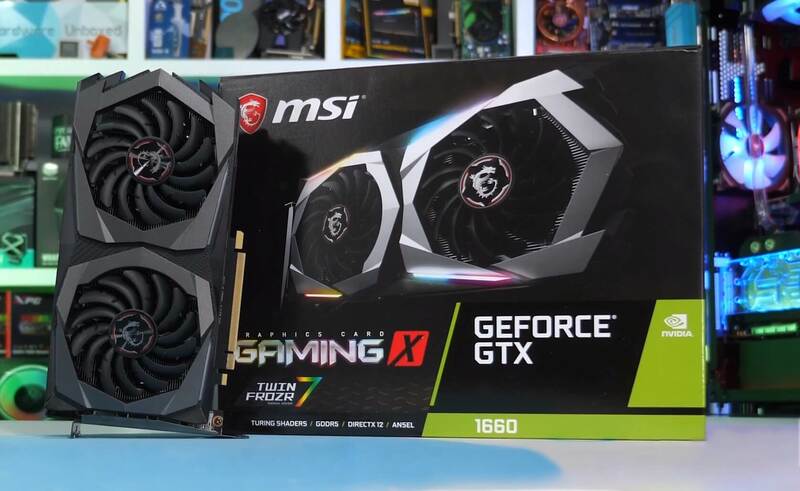 Regardless, the 1660 was never intended to be an upgrade option for GTX 1060 owners, but perhaps it is a reasonable buy for those running older cards like the GTX 960, which we'll likely explore soon.